Photographers and fine artists need the highest quality printing hardware to produce the best results. We have the best photography and fine art printers to ensure your arts looks its best. We can recommend the best photography and fine art printers with advice based on your specific needs. 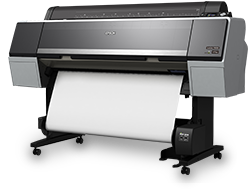 We work with industry leading brands, such as Canon and Epson, to bring you the best printers on the market. We provide ongoing support with your printer and consumables to ensure you get the best result. We keep our fine art printer prices competitive and we have solutions to suit your budget. 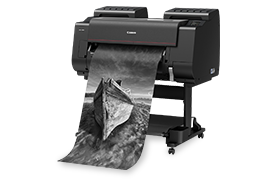 The imagePROGRAF PRO series combines high-tech software and hardware to produce stunning professional photography prints. The SureColor range of photographic and fine art printers is designed for producing the highest quality images. Need advice on your next printer? Our team is always happy to help. Does the printer have the right colour range and gamut? Faithfully reproducing your work on paper or other media is one of the biggest challenges for photographers and artists. You need to choose a printer which uses the right number and type of inks to produce the result you want to achieve. The highest quality photography printers typically use 12 inks to ensure the best visual result. Can the printer produce the level of quality you need for your work? 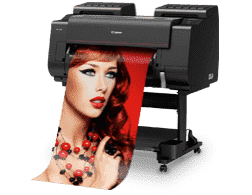 Along with the number and type of inks used, many printers for photography and fine art have other systems which help ensure a high-quality professional photography prints. These can include automatic calibration, colour correction, and other systems. Is the printer as fast an reliable as you need it to be? Depending on the output you want to achieve, some printers may be more suitable than others. There are printers for photography which include advanced paper management systems to enable high-volume output. What extra features are you looking for? Make sure you consider any extra features you need for your professional photography prints. Additional features can include proprietary software, plug-ins to work with third party software, and more. We can help you choose from the best printers for photography and fine art with expert advice. Send us your questions and we'll get back to you soon.